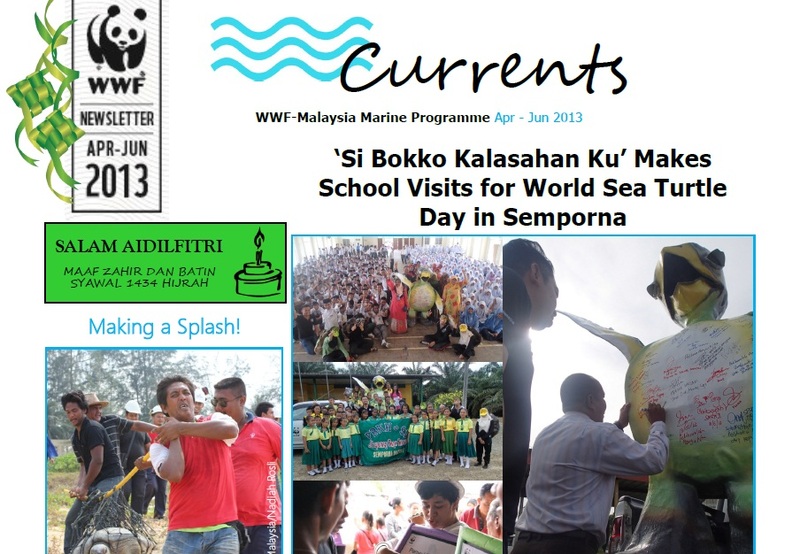 WWF-Malaysia's Marine Programme is pleased to share the happenings of another hectic yet rewarding quarter for the Peninsular Malaysia Seas (PMSeas) and Sulu-Sulawesi Marine Eco region (SSME) programmes in this issue of 'Currents'. Highlights of the newsletter include the World Sea Turtle Day Celebration in Terengganu and Semporna, an Enforcement Dialogue on Fisheries and Turtle Works, a Sustainable Seafood Forum with Retailers and Hotels, the Coral Triangle Initiative on Coral Reefs, Fisheries and Food Security (CTI-CFF) Conference in conjunction with Coral Triangle Day as well as the Anti-Fish Bombing activities held in Semporna. Apart from that, WWF-Malaysia has released the country's first turtle conservation song entitled ‘Senyum Penyu, Senyum Kita’ (loosely translated as A Turtle’s Smile is Our Smile) on World Turtle Day in honour of this iconic species. The previous quarter also saw the launch of Save Our Seafood (S.O.S) 2.0 Campaign, which marks the second phase of the campaign. 'S.O.S 2.0' aims to drive market transformation toward sustainable seafood sourcing with Business and Industry players in an effort to expand the sustainable seafood movement. We sincerely thank you for your continuous support toward our marine conservation efforts and to continue supporting us in making a difference to the marine environment in Malaysia. Happy reading and a Blessed Syawal to all our Muslim readers!